Pennthorpe School get the Buzz! A West Sussex school has been declared the winner in an inaugural competition to encourage children to play music together in start-up music groups. 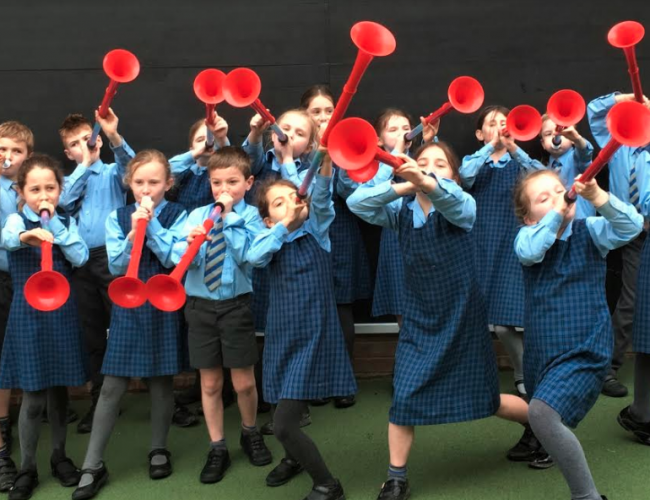 The ‘Pennthorpe pBuzzers’ – from Pennthorpe School, Rudgwick, West Sussex – have been declared the winners in Brass Band England’s ‘Create a Buzz!’ competition held in conjunction with Warwick Music Group – developers of the award-winning pBuzz. The brightly coloured pBuzz has been specially designed for children’s small hands and is aimed at being the fun first step in taking children on what, hopefully, will become a life-long passion for music and brass instruments. Costing less than £20 pBuzz is an affordable and playful product that aids a child’s sensory and fine motor skills, encourages self-expression, stimulates imagination and creativity, builds confidence – and nurtures their natural music talents. The ‘Create a Buzz’ competition involved schools, music education hubs and youth music organisations from across the UK, with five groups being shortlisted to take part. Pennthorpe faced stiff competition from other finalists from Oldham, Southampton, Trafford and Enfield. Each was asked to submit a five minute video of their musical journey, featuring a performance of composer Jonathan Bates’ specially commissioned piece, ‘Create a Buzz’ – a work that immediately became a huge hit with those who played it. Jonathan, who sat on the judging panel with staff from Brass Band England and Warwick Music Group, said: “After viewing all of the entries, Pennthorpe School was my favourite. I feel the outreach in the community and wide range of performance opportunities, coupled with inventive filming, made them stand out. Pennthorpe will receive a set of ten pCornets and pBones – both plastic instruments developed by Warwick Music Group that have achieved worldwide recognition and sales – to support the next step of their musical development. They will also be invited to perform on the main stage of the 2019 National Youth Brass Band Championships of Great Britain in March. Each finalist received a class-set of free instruments to keep and to work with over a six month period – using the free resources available on the pBuzz website. Linda Cole, Pennthorpe’s Director of Music, said: ‘The children had such a wonderful experience learning to play their pBuzzes and we will definitely be using them regularly in our schemes of work going forward. It’s been the highlight of the year and the children have had such fun.’. Warwick Music Group is the developer of the world’s first plastic trombone – pBone – and all-plastic trumpet – pTrumpet. pBuzz was developed to encourage younger players to take an interest in brass music and the new, colourful and light weight award-winning instruments have now been adopted worldwide by schools, bands and by individuals.